Pumps shoe manufacturer: Private label and custom pumps shoe manufacturer for companies and designers in Spain. We are leather pumps manufacturer quality of Spanish origin and tanning . and these are made ​​with their own private label . nubuck leather , engraved leather ... any skin type , and there is a very wide range. impact, the weight on the heel and the metatarsals of the foot, each time a step is made. 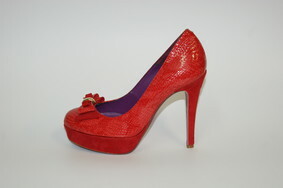 The shoe heel is synonymous with elegance, sensuality, femininity and glamour.